In the two preceding sections I discussed the main characteristics that distinguish different sectors of the nonagency market. The data in Exhibit 5-2 highlights the main differences between the sectors for the vintage year 2004. Not surprisingly, some of these characteristics have changed over time. In order to capture some of that movement, Exhibit 5-7 shows how several of these key characteristics have evolved over the past nine years. loans (adjustable-rate loans with an initial fixed period), which are included in the ARM category. Another noteworthy trend is the decline in second liens in the subprime market. In earlier days, subprime contained an average of 6% to 8% second liens. In recent years, second liens have accounted for less than 2% of subprime deals. Exhibit 5-7 also shows that FICO scores have drifted higher in jumbos, rising from around 720 in the late 1990s to around 735 in 2004. 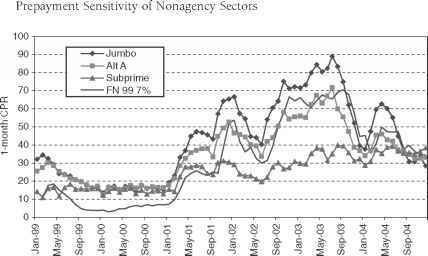 In contrast, the alt-A and subprime sectors saw their FICOs decline in the years 1999-2001. This was a period of rising interest rates, and as origination volumes fell, issuers scrambled to maintain market share by lowering underwriting standards. When interest rates fell in 2002-2003, volumes picked up, and underwriting standards tightened once again. This helped raise FICO scores in alt-A back to where they were before the 1999-2001 decline, whereas FICOs in subprime at 624 in 2004 are at a record high level. In part, the increase in subprime FICOs reflects the rapid move by subprime issuers into the lower end of the alt-A market, sometimes referred to as the alt-B or the "gap" part of the nonagency market. While FICO scores have increased, LTV ratios have risen in alt-A and especially in subprime. Also, loan size has increased in all three sectors, with the largest increase registered in subprime. Again, this reflects the push by subprime issuers into the alt-A sector, as well as the general rise in home prices and mortgage loan amounts. I have just covered some of the key characteristics determining credit performance in the nonagency market. Exhibit 5-8 summarizes these factors. I split them into two categories—those affecting default rates and those influencing loss severity. Under the default-rate section in the exhibit, I first list FICO scores because this particular credit measure has a very large impact on default rates. LTV ratio is also important because, as mentioned earlier, a high LTV ratio sometimes reflects a stressed financial situation. The remaining factors are placed in order of their relative importance to credit performance. However, it should be added that many of these variables are closely related; hence it is often difficult to make a precise ordinal ranking of their influence on either credit or prepayments. Thus this list, especially with respect to a few of the last factors, should be viewed more as indicative than as a precise ranking of credit determinants. Referring to Exhibit 5-8, under the severity category, lien is the most important. Since most second liens have loss severities approaching 100%, this factor is clearly important. Mortgage insurance is in a similar category. If a default occurs and mortgage insurance is present, loss severity usually will be reduced. LTV ratio is obviously important in loss severity, and loan size comes into play because of the fixed costs involved in foreclosing and liquidating real estate-owned (REO) property. Exhibit 5-9 lists four of the key factors influencing prepayments. I have mentioned, but not stressed, the prepayment effects of loan characteristics in this chapter. However, as I pointed out earlier, FICO scores are very important with respect to speed considerations in that they determine the amount of credit-curing refinancings a sector experiences and how easy it is to refinance into another loan. And these two elements are the ones that create stability in subprime prepayments. LTV ratio is also important in that a very high LTV ratio makes it more difficult for a homeowner to refinance. And, of course, loan size is a key prepayment factor in many sectors because the larger the loan balance, the more of an economic incentive there is to refinance. Exhibit 5-10 summarizes where the major nonagency sectors fall in terms of credit and prepayment stability. For the agency MBS market, that point on the figure represents credit in terms of FICO score, excluding the agency aspect of credit rating. Hence the jumbo sector is shown as having a credit (FICO) similar to agency collateral. However, because of their larger size, jumbos are less stable from a prepayment view than agencies. Alt-A has a lower credit than agency and jumbo, and because its size falls between the two, so does its ranking in terms of prepayment stability. The subprime sector has by far the lowest credit rating, but it also is by far the most stable in terms of prepayments. Exhibit 5-10 essentially shows how collateral within various sectors behaves and the tradeoff between credit and prepayment stability. It is not possible just using collateral to migrate to the desirable, upper-right section of the exhibit. However, it is possible to move in that direction via financial engineering. For example, an agency planned amortization class (PAC) bond would be on the same credit line as agencies, but would exhibit more prepayment stability. The relative prepayment volatility for the three nonagency sectors is illustrated in Exhibit 5-11. This exhibit shows prepayment speeds for fixed, seasoned loans with 0 to 150 basis points of refinancing incentive for the three nonagency sectors and 1999 FNMA 7s for comparison. Jumbos show the most response to interest-rate changes, followed by alt-As and then subprime. This relative response to rate moves is the reason that investors are concerned primarily with prepayment speed in jumbo and credit in subprime and both in alt-A. parts, cumulative defaults and loss severity. Both default and loss severity are the lowest for jumbo, next lowest for alt-A, and greatest for subprime. Total cumulative losses amount to 5 to 10 basis points for jumbo deals, 50 to 60 for alt-As, and 400 to 450 for subprime. Of course, the rating agencies require more credit enhancement for the riskier subprime loans and more for alt-A than for jumbo loans. Exhibit 5-13 shows the typical amount of enhancement required for the various rating classes (AAA, AA, etc.) and then compares those enhancement levels with expected losses. This yields a set of loss coverage ratios for the various rating classes for each nonagency sector. AAA bonds for jumbos have 25 to 30 times coverage, alt-As 10 to 12.5 times coverage, and subprime 4 to 5 times coverage. At the BBB level, Jumbos have 4.5 to 5.5 times coverage, alt-As 2.5 to 3.3 times coverage, and subprime 2.0 to 2.5 times coverage. These coverage ratios suggest that credit losses can increase by many multiples before most nonagency MBS would encounter a loss of principal. Are you falling off in Debt? Stuck in a bad Credit? 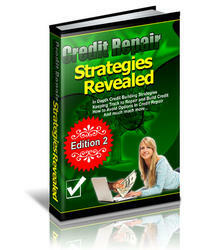 Undergoing much hassle with those hard & frequent Credit Calls? … Or maybe you are just now experiencing hard time to secure any loans for yourself? - Then this may be the most important letter you'll ever read for today... 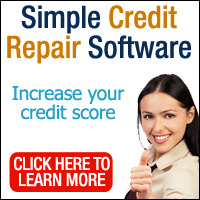 Discover The Insider Secret Manual That Allows You to Repair Credit score, Enjoy Your Freedom To Get Approved On Any Loans You Wants Even If You Have No Credit Building Experience Or Suffering From Deep Negative Credit History!